Don't just experience the Pink Palace, join the ranks of those who helped create its storied history. 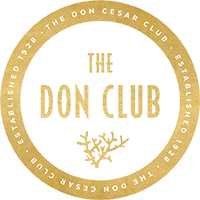 With an exclusive Don Club membership, you can enjoy special, members-only amenities like quarterly social events, the membership loyalty program, discounts on room rates, waived resort fees and 50% off day passes for your guests. Enjoy happy hours in the Rowe Bar from 5:00 PM - 7:00 PM, poolside privileges, luxury beach loungers and one 30-minute Spa Oceana service per month. There's no more luxurious way to join the legacy of The Don. To make history, contact the Club Director for more information, 727-367-0862.